The ensuing journey was one of terrifying turbulence, many nerves, a few tears and a long time in transit. From Queenstown to Auckland, on to Gold Coast, overnight for KL for a day, on to New Delhi and then a few hours kip in the airport waiting for the family to arrive through customs a few hours later, it was 48 hours of transit. After a wave of hellos, we were picked up to be taken to our airport. Now 3am, but feeling like the 10.30am it was in New Zealand, it was still a scorching 26 degrees. The time sits on a half time zone, 4.5 hours ahead of the U.K. The currency Rupees, 80 of them to the pound. After a few hours rest we made for the pool, the heat of the day already building around us. We were then collected to be taken into the city. The traffic was bustling, slow moving but fluid as horns were used instead of indicators, every opportunity seized and the idea of lanes, a foreign concept. Tuk tuks fought with pedestrians, rickshaws, monkeys, cows, dogs, buses and private cars (like ours which has ‘tourist’ blazoned across the front.) 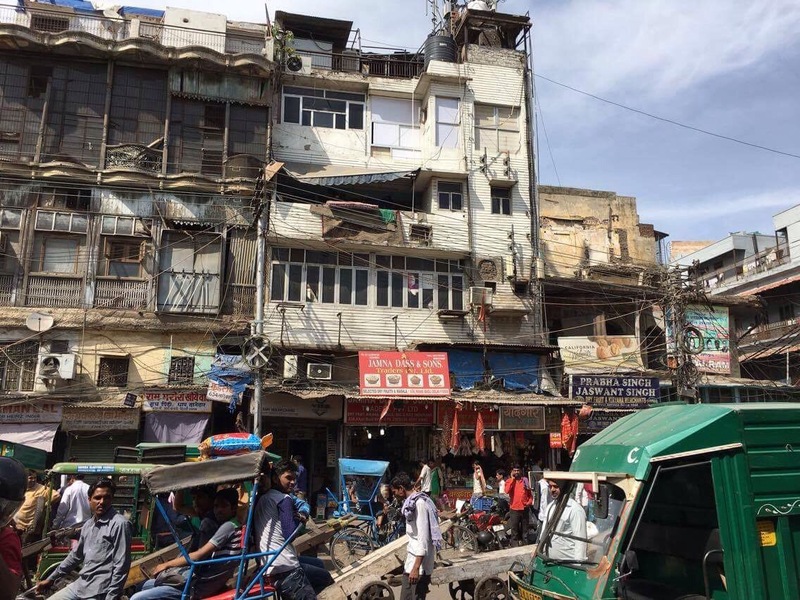 There is 25 million people in Delhi, 25,000,000 parallel lives, and said to be around 1500 car sales made in a day. 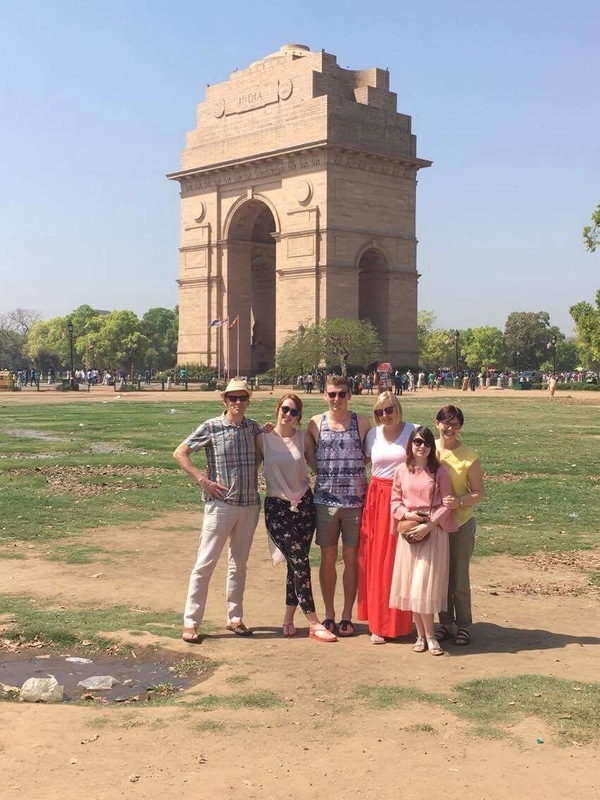 With our guide Jimmy, a slow, deliberate man, India’s David Attenborough, we made our way to Old Delhi to look at Ghandis grave, Rajghat. 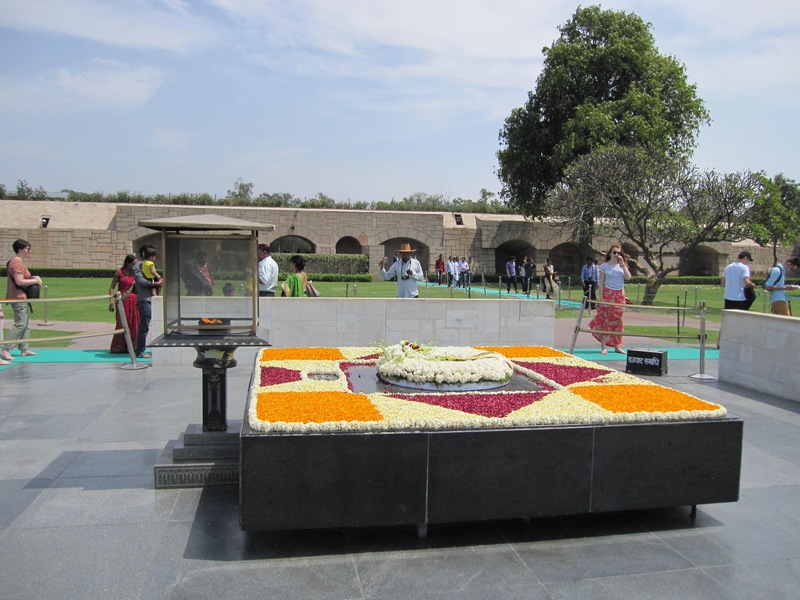 Ghandi was significant for being a well loved revolutionary who gained India independence from the British in 1947. We approached his simple grave from above to look down on the square structure burning with an eternal flame. Jimmy had unusual ways of capturing our attention, demanding we all gather round. He compared Bex to Indias Bollywood superstar, Karina Kapoor and directed all historical facts toward me, his fellow historian. 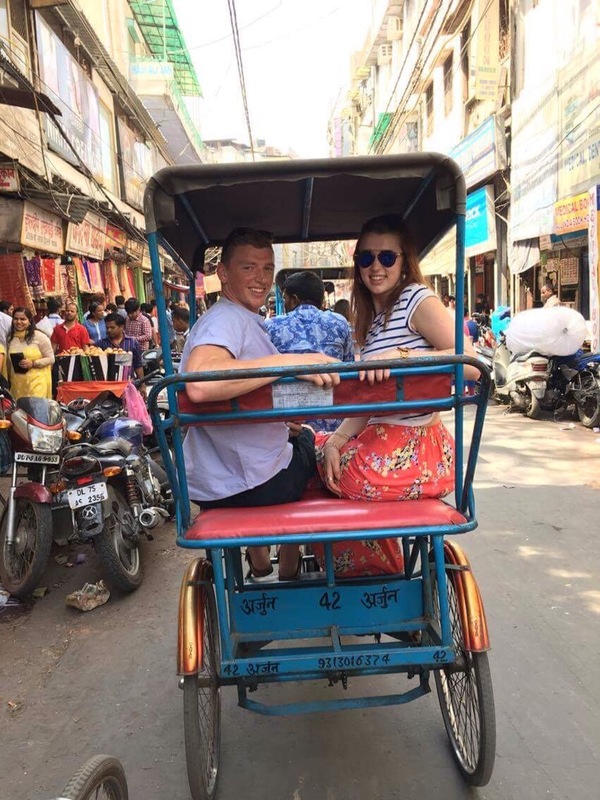 We were booted from our comfort zone to get a rickshaw ride at Chandni chowk, a network of markets and lanes with shop fronts spilling into the street. 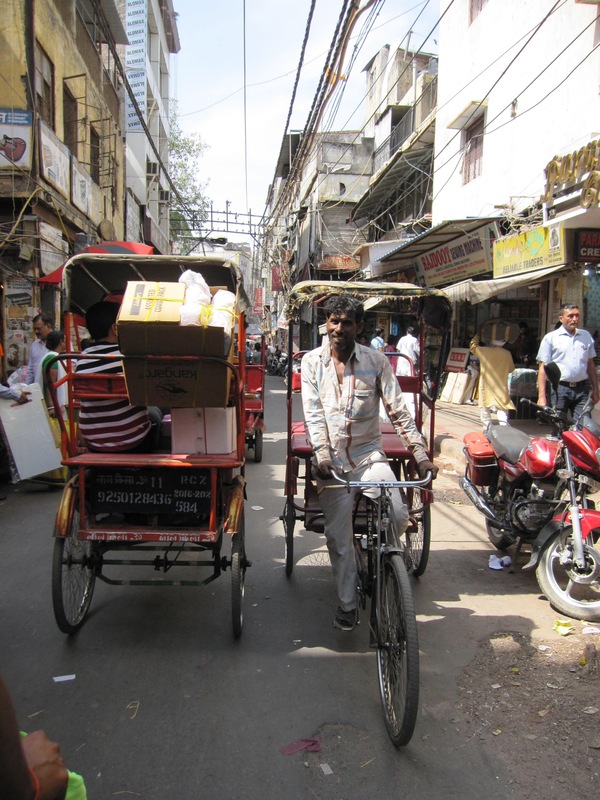 In our pairs, our hot driver peddling at some speed, we weaved down this network of narrow alleys, each one with entwined cables running amok over our heads. 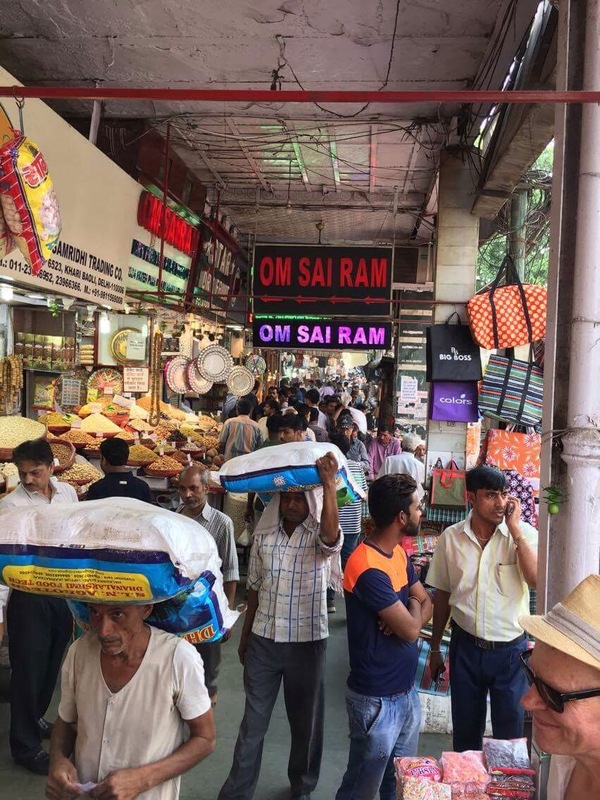 One street sold mostly silk, another, wedding street, sold saris. The noise was palpable as drivers whistled in place of a horn, swerving by millimetres the oncoming carts and people who appeared unperturbed. There is a complete lack of aggression in every near miss and crazy move, maybe a telling hand wobble to signify it’s okay, an incredible move away from road rage. 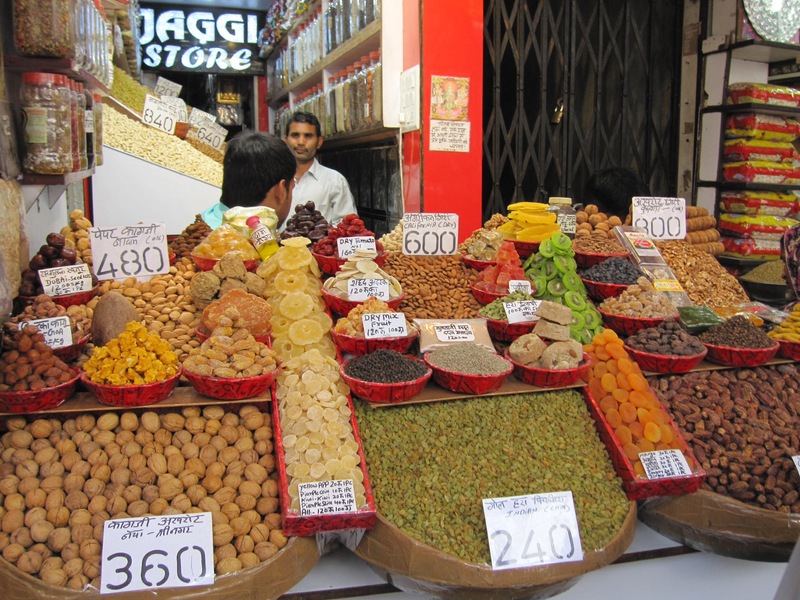 At the end of the road we stepped out at the spice market where the street ran on for four miles of colourful hubbub. The architecture if you cared to look above the level of shopfront was a mix of architecture with pieces added on over the years so wonky compartments barely connected. 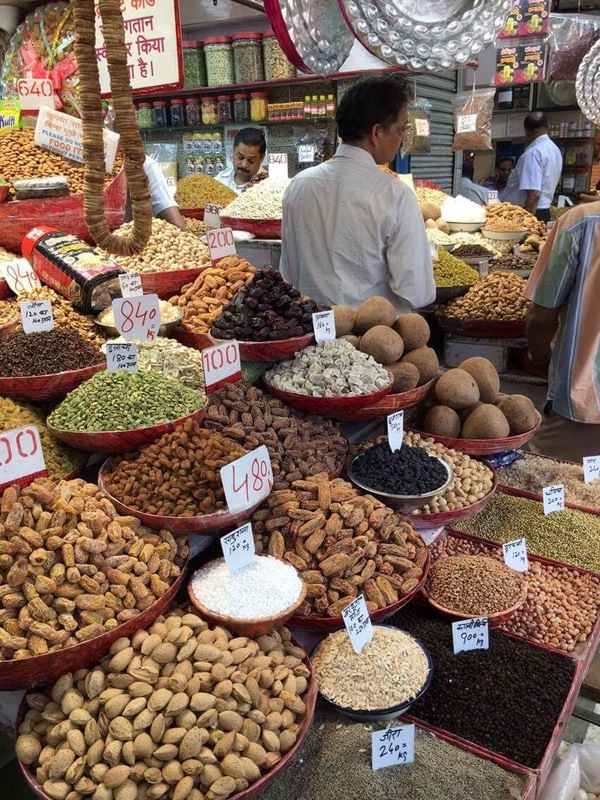 We were taken into a spice market to sample. The smells of spices, seeds and teas were pungent, amplified from anything you have smelt before. Teas in mango, blueberry, rose and chai refreshed our thirst, cinnamon bark broke sweetly on your tongue and the variety of curry powders in each shade was overwhelming. 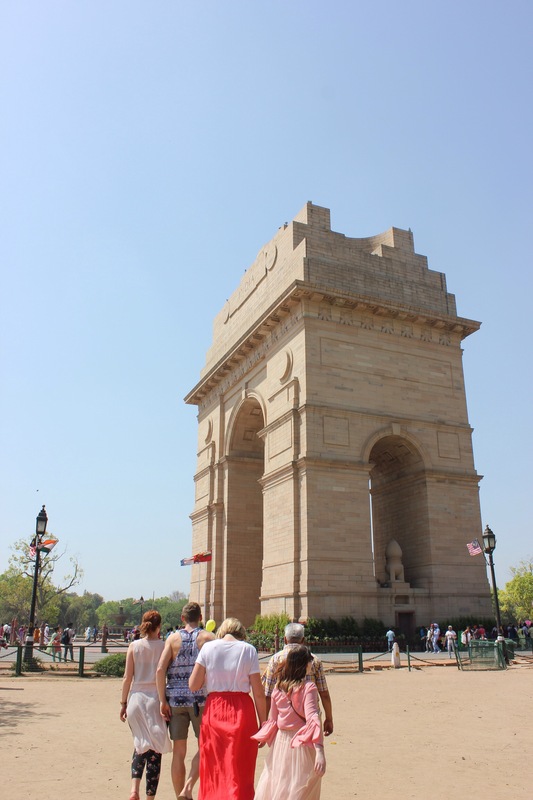 Our drivers escorted us back up the street to be dropped outside the red fort. 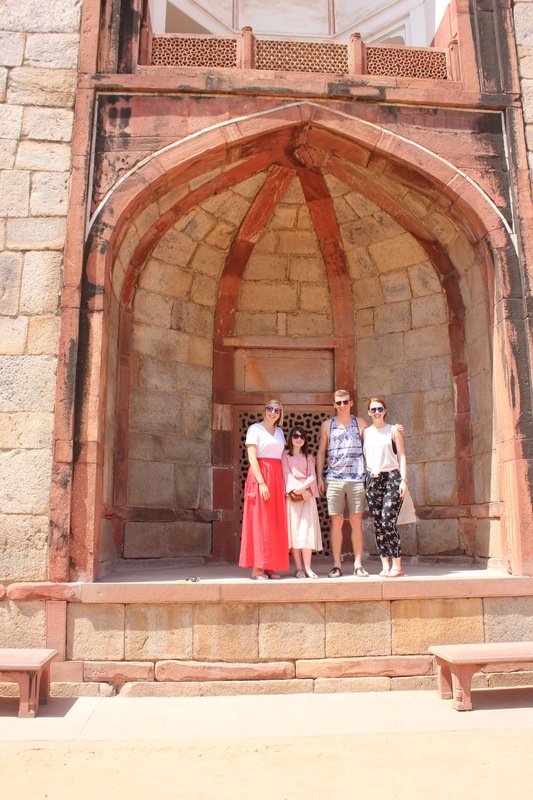 Its imposing sandstone structure first built by the Mughul emperors, the same who commissioned the Taj Mahal, but before he could take up residence his son imprisoned him in Agra Fort. 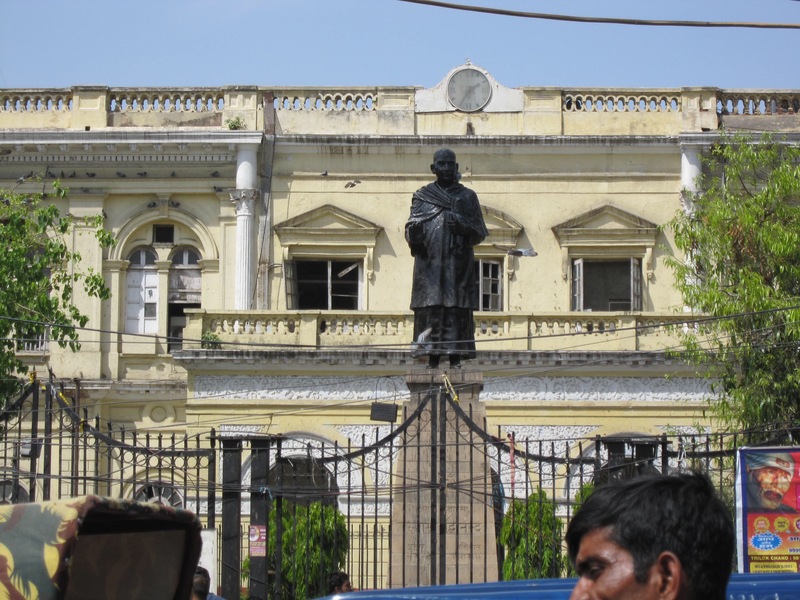 It was home to the last Mughul emperor before he was flushed out by the British in 1911. They subsequently turned it into military barracks. 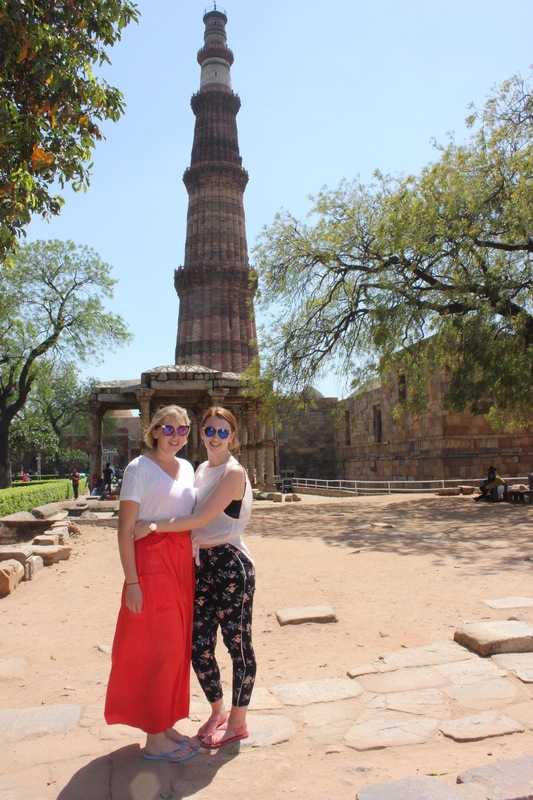 Just 15 minutes drive from old Delhi is New Delhi and on our second day we set out to explore the more regal part of the city. 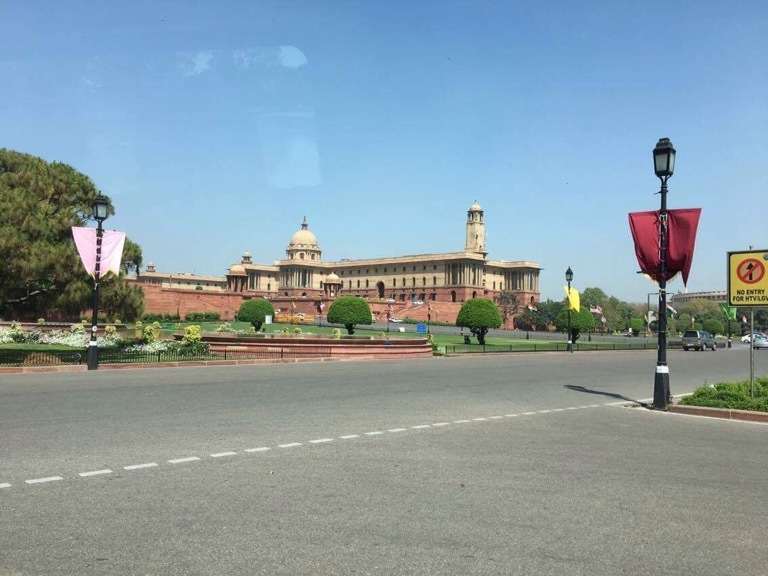 In this area, the regal British structures of Parliament House, once the house of the Viceroy. 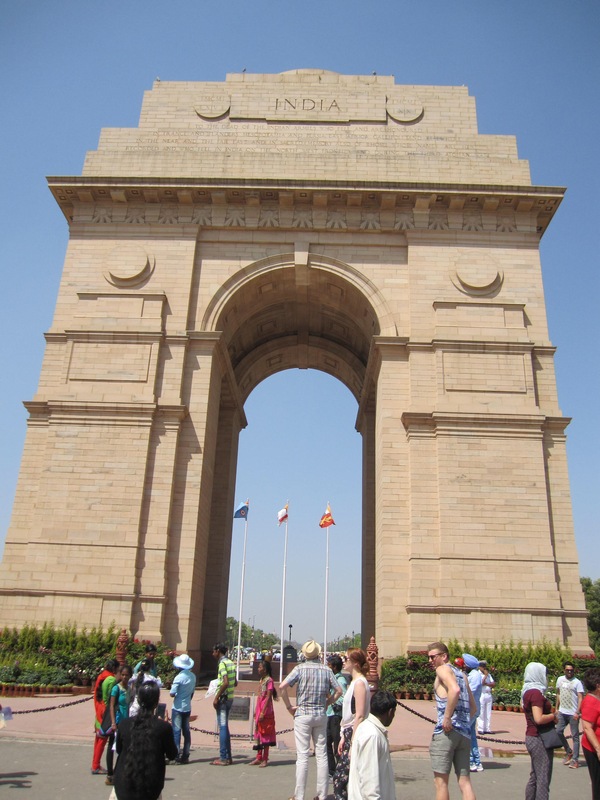 In alignment with this beautiful building is India Gate, an arc de triumphe like structure memorialising 90,000 Indian and British troops lost in World War One. 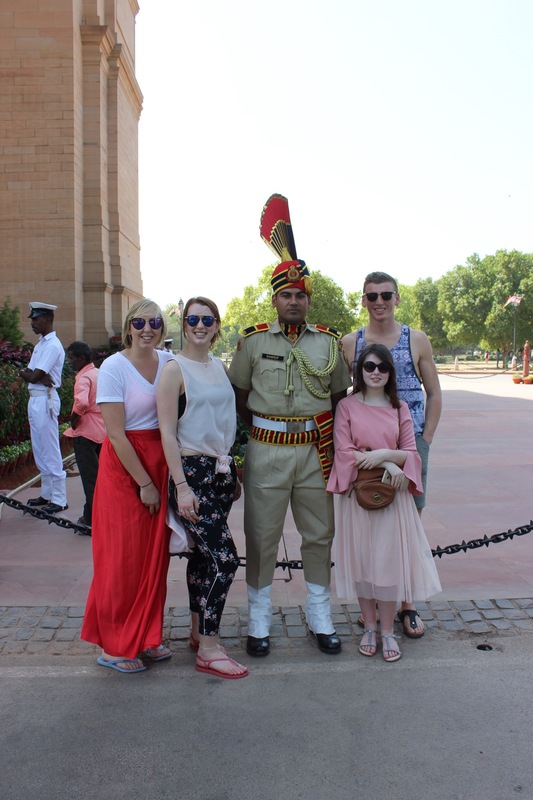 We walked up to the vast memorial, having our photos taken so candidly by Jimmy, where an eternal flame burnt in the middle protected by both armed and ceremonial guards. Jimmy told us that this is where misbehaving or lazy police were sent for punishment duty. 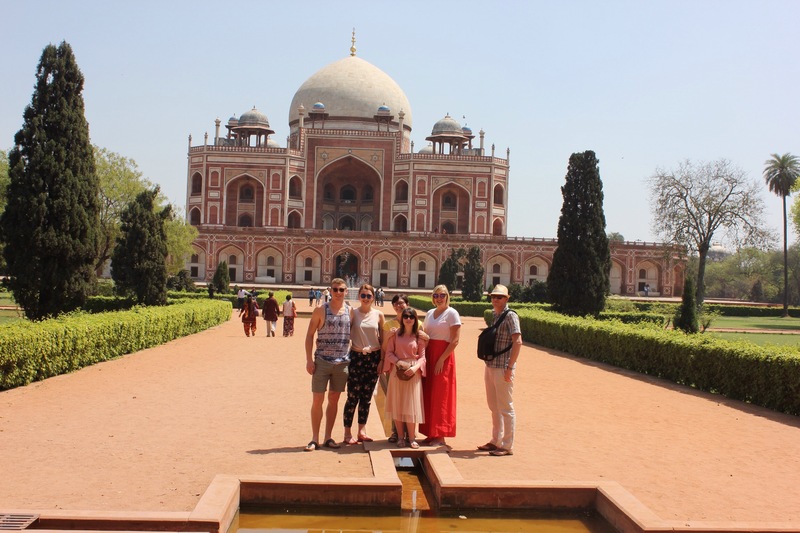 We visited Himayuns tomb, pre dating and strongly influencing the Taj Mahal. It’s red sandstone perfectly symmetrical to honour those buried within. 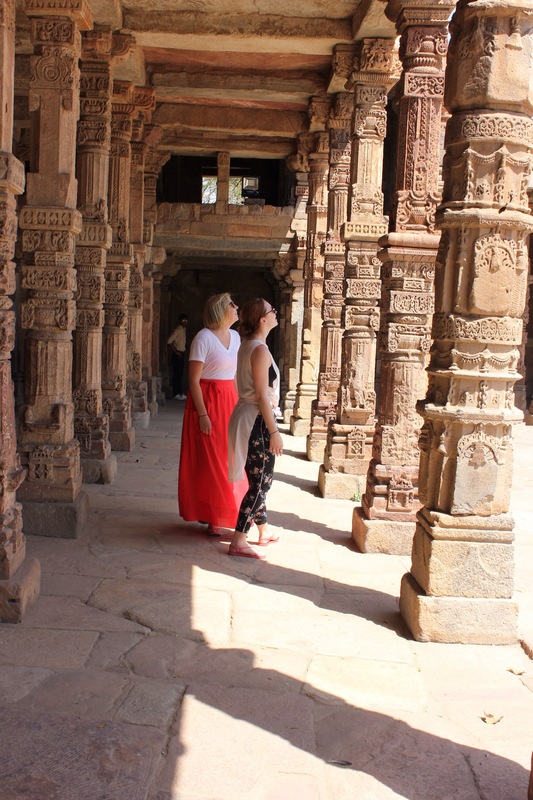 We climbed up to explore inside the decorated mausoleum, the cool marble inside a perfect contrast to the warm sandstone. 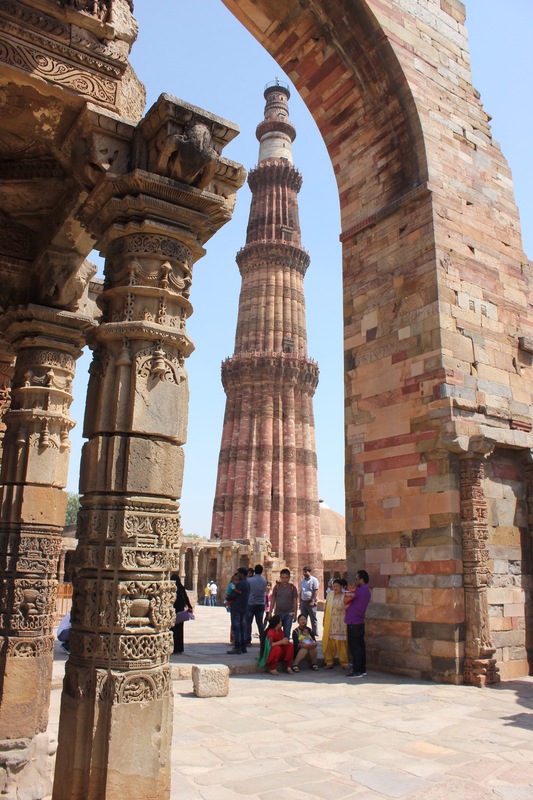 Another impressive structure we visited was the Qutab minar, a tower stretching high over the area, looking like the folded pages of books made up the outside. Each layer, there is now seven, was added by each subsequent Mughul emperor. Despite the beauty of this city, I asked Jimmy where was the heart, the centre of the city. Maybe just the way in which we explored it, ferried between monuments, but I felt I had not begun to understand the city or find a place within it yet. 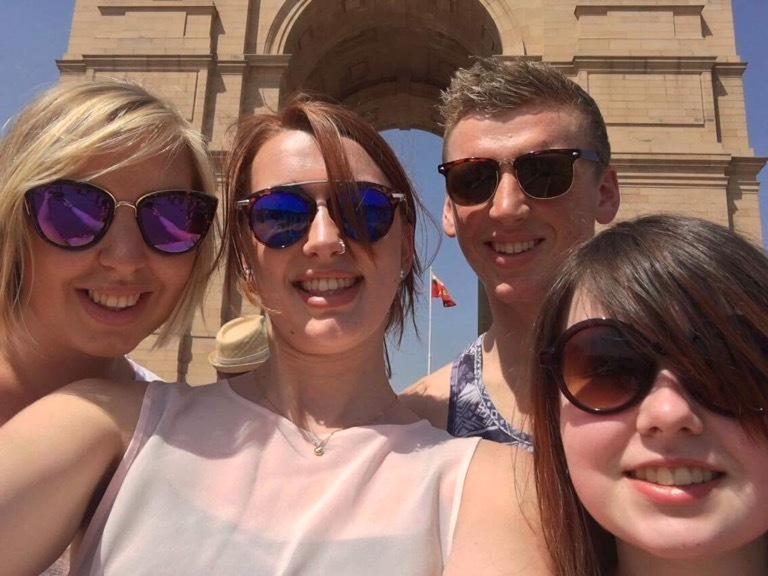 It had been a mere taster of a diverse and exciting country we had yet to explore. So colourful and so crowded. 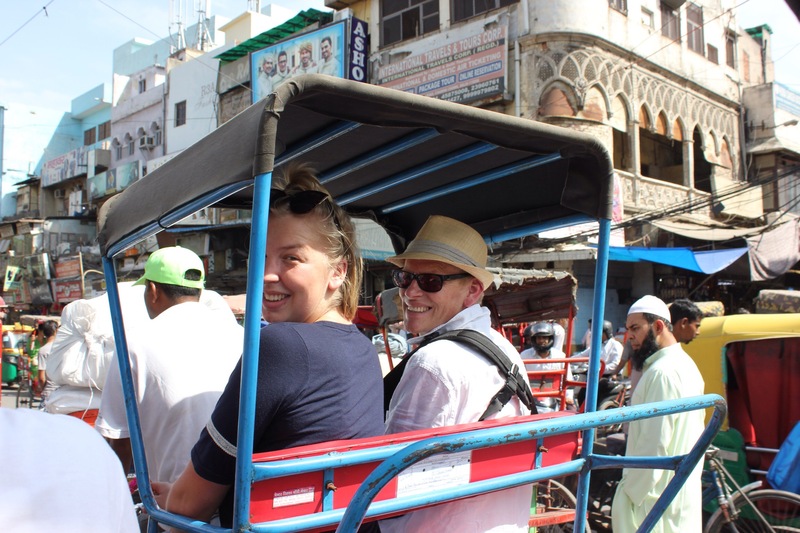 How did it feel to be in a Rickshaw I wonder. The electric (?) 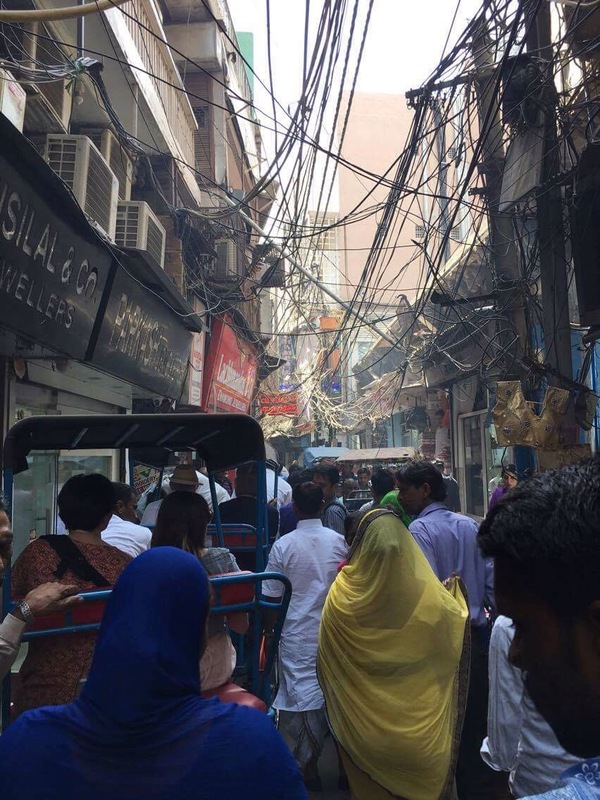 cables above the rickshaw look like spilt spaghetti. Love all the photos. Sounds like we need to go back and see the things we weren’t shown first time around! !